The first in our insider's guides comes from Sheri Scott. 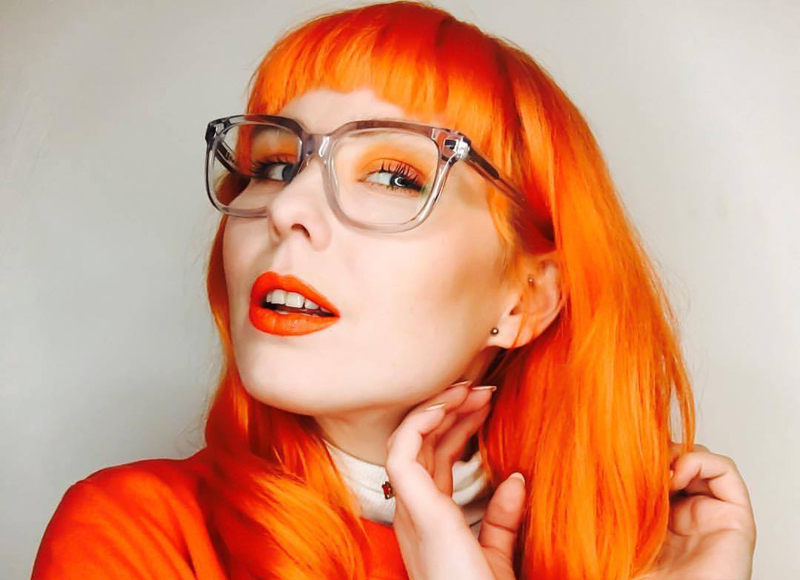 The orange hair and glasses behind leading Fashion and Lifestyle blog, Forever Yours Betty, Sheri is Scotland’s go to for who to know, where to go and what to see. Follow her journey over on instagram at @foreveryoursbetty. Having lived just a stone's throw away from Edinburgh my whole life, it’s easily one of my favourite cities in the UK to visit and with good reason too – it’s absolutely drop dead gorgeous. 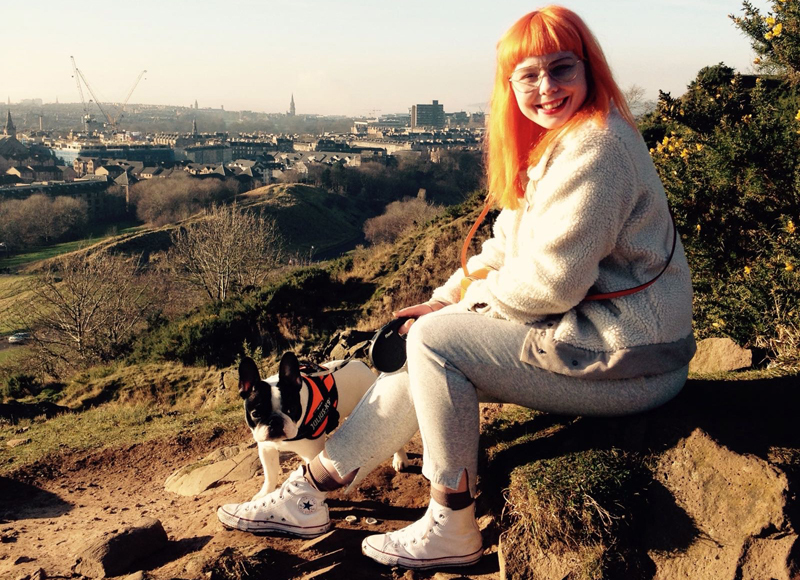 With its gothic glamour, rolling hills, rich history and fantastic patter, it is truly a travellers delight, and I’m not even talking during the Fringe! Filled to the brim of things to do, sights to see and experiences to be had, Edinburgh has got to be on your travel list and here’s how to do it right while staying at The Principal Edinburgh. If you find London a bit hectic, Edinburgh is definitely the capital city for you. Smaller, peaceful, and on a much more manageable scale with most landmarks being a short walk or an affordable bus journey away. Whether you choose to visit the castle, one of the many Art Galleries or Exhibitions or just walk the historical streets, Edinburgh’s fascinating history is inescapable. The tourist traps, while granted, busy and a little overpriced, are always still worth doing. Edinburgh castle sits at the top of the quaint and traditional Royal Mile where you can explore ancient walls, prisons and battlements. Just brace yourself for the cannon, which fires at 1pm daily. Just behind the castle there’s good old Arthur's Seat. You can reach the peak after a 45-minute walk giving the ultimate views of the city. If I were you, I’d set one morning aside and wake up early to catch a glimpse of the sunrise over the city. It truly is magical to witness. If you’re into spooky, the legendary ghost tours take you to the deep underground city via the lost labyrinth of Mary King’s Close. Frozen in time, these 16th century narrow walkways and streets were built upon and buried in the name of creating a more ‘developed’ Edinburgh, closing the streets out once the plague set in. Now safe and open to the public, you can wander around these (hundreds of years old) streets that are considered to be haunted by the old residents. Take a friend, you will need a hand to hold! Peer behind the Edinburgh’s tourist façade and you’ll find loads of hidden gems and unusual quirks ready to be stumbled upon. Although you’re always guaranteed to find bagpipers and kilt shops strewn along the way, Edinburgh is a modern and innovative city that celebrates its cosmopolitan vibe, with culture at every turn. 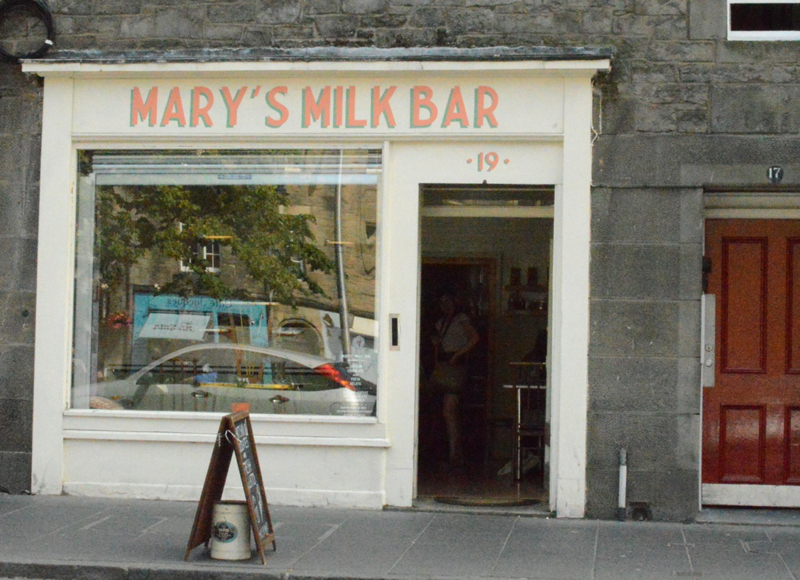 Whether choosing fresh ice cream in the summer or a decadent hot chocolate in the winter, Mary’s Milk Bar in the Grassmarket is a must. Often found by the queue out the door for her homemade gelato, Mary’s ever changing menu guarantees to tickle every taste bud with combinations such as Milk chocolate and lavender to Spiced pumpkin and pistachio. Although perhaps better known for Trainspotting (there’s a tour for that too) it’s reported that JK Rowling wrote the first chapters of the Harry Potter series within Edinburgh’s Elephant House Cafe. Proudly calling itself ‘Harry’s Birthplace’, even if you’re not a fan, the themed menu, amazing coffee and Potter graffiti toilets make it worth a visit alone. If you’re not heading next door to The Printing Press, there are literally hundreds of culinary delights to experience while in Edinburgh. If you’re visiting for a special occasion, The Witchery is a must. The sumptuous, gothic décor and incredible food make it a real treat, looking right up to Edinburgh Castle, it has style atmosphere in abundance. Scran and Scallie is a local favourite and has a relaxed, gastropub atmosphere. Owned by the Michelin-starred Tom Kitchin (you might recognise him from Masterchef and Great British Menu), its rustic menu choice is perfect for someone wanting to sample traditional Scottish dishes with plenty of local ingredients. Let’s taco ‘bout El Cartel. Don’t be fooled by the Mexican assumption of bottomless nachos and jalapenos, El Cartel brings a tasty array of slow roasted meats, seafood and vegetarian options jam packed with flavour. The guacamole with feta cheese and pomegranate seeds served is delivered with a side of plantain chips, and if you don’t order a second and/or third portion I’ll be forced to judge you. As you could imagine, Edinburgh is filled with an amazing mix of bars and pubs that cater to all tastes and tipples. From old school pubs to cool bars with bespoke cocktails, Edinburgh certainly does not disappoint in its range of great places to drink. Soaked in history, The Devil's Advocate is one of Edinburgh’s best little pubs that every visitor should enjoy once… twice… or more! Centrally located mystically within the walls of Edinburgh’s steep stairways by The Royal Mile, The Devil’s Advocate pride themselves on hosting some of the best bartenders in the city. Panda & Sons is arguably the most famed of hidden cocktail gems in Edinburgh. Disguising itself as a barber shop as you walk through the bookcase into a cool, prohibition style bar, Panda & Sons is all style with added substance. From craft beers to carefully concocted cocktails, once you find your way in you may never want to leave. If you’ve still not had your fill of gourmet cocktails, Lucky Liquor Co. on Queen Street is sure to sort you out. With its retro decor and killer concoctions, the bar man will for sure keep you on your toes - albeit a bit wobbly! No matter where you go or what you do, let the magic of Edinburgh capture your heart. I’m sure it won't be the last time you visit.